From a teeming Web site and a busy store in Ballard, Washington, Cookies sells more than 2,000 cookie-making ingredients, utensils, jars, tins, decorations, and bakeware. Space is tight and items are seasonal, so daily trips to off-site storage mixed up stock levels. Web customers weren�t happy when they saw an item, but couldn�t get it, because buying hadn�t equaled demand. Realizing she needed to computerize, the owner acquired a Microsoft Dynamics� � Point of Sale system based on an IBM ThinkCentre PC. It came with touch screen, scanner, pole display, and receipt printer. Keeping mental inventory of 2,000 small items and their rates of sale in the store and from the Web site was making Caryn Truitt, owner of Cookies, frazzled. Cookies is in Ballard, Washington, but storage is at home, so Truitt updated a large Microsoft� Excel� spreadsheet daily to track what was where. Days became long and errors crept in. Her electronic cash register didn�t track items so buying required too much guesswork, especially when a stock-out could alienate Web customers. She acquired Microsoft Dynamics� � Point of Sale, which includes Microsoft Office Accounting 2007. Her specific system came with an IBM ThinkCentre PC and retail peripherals. It resolved a baker�s dozen problems because the software decreases its stock levels with each sale, and sends data to the accounting software. Truitt now buys more wisely, knows item levels, and is very glad for new peace of mind. A charming shop aptly named Cookies sells nearly everything a home baker would need to make his or her cookies the envy of the party. Owner Caryn Truitt and an associate sell more than 2,000 SKUs (stock-keeping units) from a single register in the nearly 250-square-foot shop on Seattle�s (Washington) well-known Market Street. A very complete and well- organized Web site sells classes and nearly all items available in the store. At first, I thought this system was more than I needed for my size store....Now I see that using all its features will help me grow our revenues to the size I want. The store and its 120 square feet of offsite storage are filled with aprons, potholders, towels, bakeware, utensils, baking sets, kits, cookbooks, recipe cards, cookie cutters and stamps, cookie jars, plates, tins, ingredients, mixes, specialty sugars, sprinkles, and decorations. Cookies carries items for religious and other holidays, sports, and even regional themes. From season to season, one item may outsell another, but cutters and sprinkles consistently bring in the highest gross. Truitt had never automated because she felt her store was too small to justify the cost. She thought she could manage well enough using paper and her electronic cash register (ECR). �I had been looking, but only for future use if I decide to franchise. I was looking into QuickBooks Point of Sale, but the business selling it couldn�t answer any questions about it. They promised to learn the system and call me, but never did. Where would I get support? Since easy daily use and technical support were important to my growth plans, I didn�t have the time to find someone who could demonstrate QuickBooks POS. �I also considered a system of a small software company, and tried to talk to them at a gift show. Again, I couldn�t get help, so I couldn�t evaluate the product, so I left. In November 2005, one of retail�s busiest months, Cookies installed a Microsoft Dynamics � Point of Sale system combined with an IBM ThinkCentre PC and retail peripherals. Point of Sale comes with Microsoft� Office Accounting 2007 and automatically sends sales and other data to this powerful accounting solution. The store was crowded with customers, new merchandise, and the system�s boxes. Truitt says she could have sped installation by opening and connecting one peripheral at a time, rather than opening all the boxes. �I was like a kid at Christmas,� she says. �Microsoft Dynamics � Point of Sale has made me regret I put off automation,� she says. Easy and thorough inventory control resolved a multitude of problems well known to Truitt and other retailers. �It tracks what I receive and when we sold it. And I have reports to prove it,� she says. Short, easy tasks get done sooner than tough ones. Now it�s fast to enter inventory when it comes in, so my stock levels are always current. �Finally! I don�t have to keep up my Microsoft Excel spreadsheet every day when I receive merchandise or move it to or from storage,� says Truitt. �Getting rid of that chore gives me back so much time. The integrated barcoding in the IBM bundle with Point of Sale drives many benefits besides speeding up lines in the busy store. �If an item doesn�t come with a barcode, we barcode and label it with a price here. The software prints our own labels with the barcode, price, and my SKU. �This has definitely saved me money in shrinkage because no one can get away with switching labels. Scanning an item displays its description on the screen and the pole display. That description better match the item in my hand! 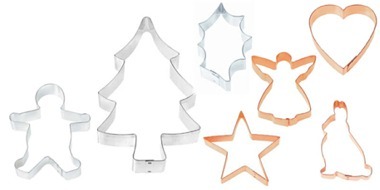 If a thirteen-dollar copper cookie cutter displays a description of plain metal two-dollar cutter, everyone knows it. �I definitely use those reports!� asserts Truitt. �I use the time-clock report every time I do payroll. When I think I am running low on some products, I tailor a report to print just out-of-stock items, so I know what to urgently buy. But just as important, I can temporarily pull them from my Web site, so online customers aren�t disappointed by ordering something we can�t deliver. �I really love our new ability to store every receipt. I�ve only had one bad check since installing it. I felt much calmer just displaying and printing out the actual receipt. Seeing the items jogged my memory and I knew who wrote the bad check. �I already use Microsoft Office Accounting for deposits, payroll, and credit card sales, because I know it will save me tons of time."